This is another reason we want to move to Florida. See the numbers on the top? Those would be our weekly highs. I like how they write “cold” on the graphic. As if we can’t look at the numbers and realize on our own that it’s cold. I was tooling around Northern Florida real estate websites last night and am surprised at how much house (& land for that matter) you can get for the money in the panhandle. Plus a lot of it is situated between the gulf and a lovely state forest preserve. Now if only I could find a job to pay for a house/place to live. I am sending resumes, letters, and applications nearly daily and have yet to hear back from anyone. Not even a “no thank you”. We might end up resorting to our least liked plan and just move when our lease is up and look for work once we get there. There are plenty of employment agencies, so temping might not be out of the question for a while. The only fly in THAT ointment is insurance coverage. In fact, we are so set on moving to Florida that we are foregoing the Alaskan cruise and are using that money for the move. Thankfully it was Bob’s idea. I thought we could actually do both but Bob decided that he would rather live in warmth near the ocean at this time. I spent the weekend recovering from the crud from last week. My eyes and nose watered nearly constantly. All weekend I had that particular tickle in my nose where it feels like I had to sneeze but never could. Most of Saturday was spent doing laundry and cleaning. After sitting around my apartment for 2 days I felt like a good cleaning was in order. I also found a good deal on humidifiers. I found a cool mist humidifier for $15 at our local Aldi. I put that in our living room. Then, while on a drug run to Walgreen’s, I found a warm mist humidifier on clearance for $10! I put that in our bedroom. I don’t know if Bob’s noticed a difference, but I sure have. The cats aren’t sneezing as much and we aren’t shocking one another with every touch. Yesterday I was determined to get out of the house. I went to Kohl’s to take exchange a place setting of Fiestaware. I was given a place setting as a gift but it’s in a color that dominates our dishes. I wanted to get the newer green but this particular Kohl’s only have the red, orange, and yellow. So I got the yellow. I also found a 2-opening frame on sale so I picked that up to house my official graduation photos. Once I left Kohl’s, Bob called and asked if I could pick up his prescription and I also had to pick up some new bird food and a couple of things at the grocery store. Once home, I started a roast in the crock pot and put everything else away. I ended up cutting the roast in half, shredding 1 half and using it for enchiladas. They turned out fabulous! The other half we will have for dinner tonight with mashed potatoes and gravy. Tonight I have physical therapy. I was originally scheduled for 3 times a week, but it’s going so well that my PT said once a week for now is good. After next week we will re-evaluate. I don’t really like it, but whatever. As long as I don’t need surgery, it’s a good thing and I’ll endure. So, CJ came to bed last night letting me know that he forgot to tell me about something we had to do this weekend. I asked what, he said go to your party. I asked him, "Were we invited?" He said yes. So, last night was the first I heard about it, except on your blog. We plan on coming, though I hear he didn't RSVP, so let me know, or him know, if it is too late. Thank you for my birthday card - it was perfect! I hope plans for the Florida move are "moving" right along! Wow, and I thought we were dealing with cold weather with highs in the 20s to 30s! 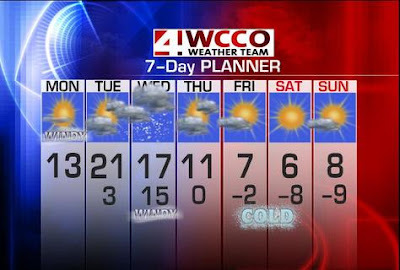 As much as I love snow, I just don't think I could handle temperatures dipping that low on a regular basis in the winter. What is going on at Flickr? A Degree Comes in Handy...Who Knew?